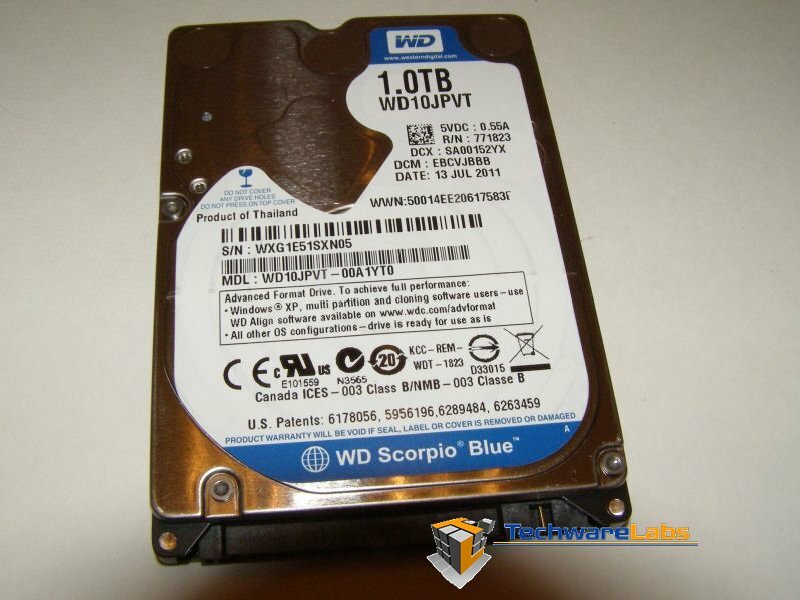 If you are looking for maximum storage capacity in a 2.5” form factor drive which not only has the most storage space to date, but also out-performed 3.5” drives that came before it then you’re in luck, Western Digital has released their new Scorpio Blue 1 terabyte 2.5” drive. This small drive has opened a whole new world to laptop users who are looking for storage space and performance at a reasonable price. The Scorpio Blue drive is still a spindle drive so it won’t perform as fast as an SSD, but at 1tb of storage space and a price tag (at time of review) of $150 you can’t touch this much capacity for this price with a SSD. Let’s take a look at what the Scorpio Blue is and has to offer. We initially took the Scorpio drive and installed it in our Lian Li portable drive enclosure which allowed us to connect at USB 3.0 speeds. We ran a gauntlet of benchmarks this way and then installed the Scorpio Blue into your benchmark PC and ran the drive through the same gauntlet of benchmarks again. 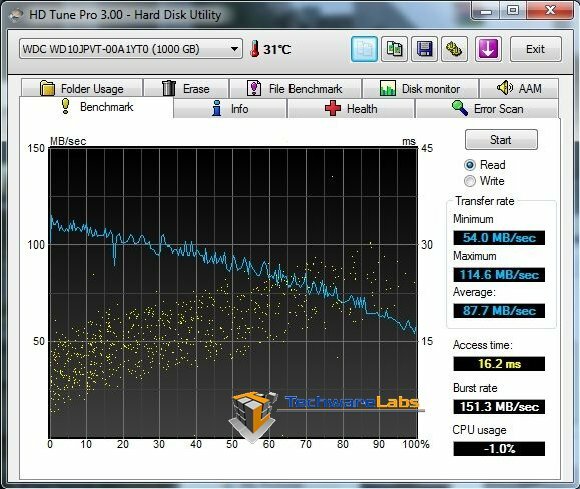 Below is a snapshot of the TurboHDD software showing the drive is connected at USB3.0 and ready to go. Storage capacity for 2.5-inch form factor drives with standard 9.5 mm height has arrived at a realm once thought to be impossible – up to 1 TB – giving you all the capacity you need to keep your photos, music and files right there on your notebook. In a notebook drive, silence is golden. WD’s exclusive WhisperDrive technology yields one of the quietest 2.5-inch hard drives on the market. WD’s SecurePark parks the recording heads off the disk surface during spin up, spin down, and when the drive is off. This ensures the recording head never touches the disk surface resulting in improved long term reliability due to less head wear, and improved non-operational shock tolerance. 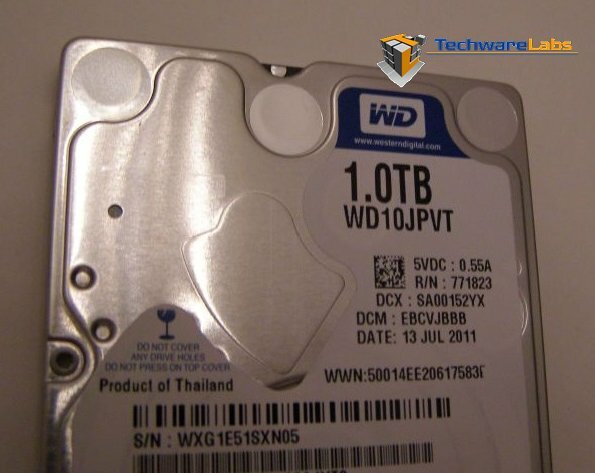 Technology being adopted by WD and other drive manufacturers to continue growing hard drive capacities. 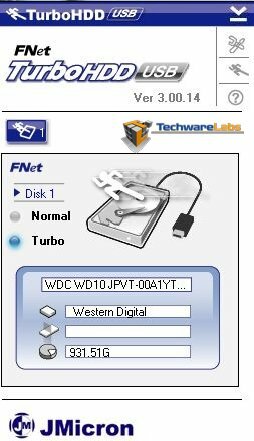 New drives featuring AF are optimized for operation with Windows 7, Windows Vista and Mac OS X Tiger, Leopard, Snow Leopard. For older operating systems such as Windows XP, users must run the free WD Align software utility to achieve the full performance of the drive. WD’s ShockGuard technology protects the drive mechanics and platter surfaces from shocks. Portable digital devices of all kinds including notebook computers, external storage, and digital media players. The 2.5″ Scorpio wasn’t anything out of the ordinary to look at. The blue colored label does grab your attention though. Closer look at the label confirms we are dealing with a 1TB drive and again with the blue label brings your attention to the fact this isn’t your standard stock OEM 2.5″ drive. Flipping the drive over we see the standard SATA connections and power plug for a hard 2.5″ drive. The Scorpio Blue from the bottom side of the drive is nothing out of the ordinary, but this is what is truely amazing about this drive though. 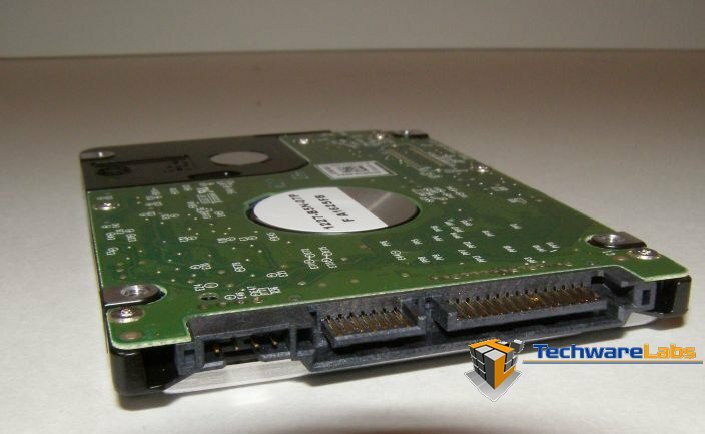 Western Digital was able to engineer a 2.5″ and keep the look and size of any other drive on the market today, but was able to shoe horn capacity of 1 Terabyte into a 2.5″ form factor. 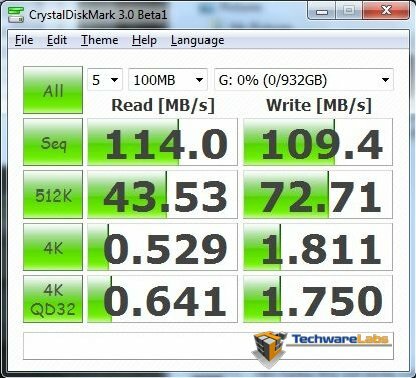 The Scorpio Blue looks just like any other drive on the market today from the appearance of it which is truly an engineering feat in of itself, but next we will put the drive through some benchmarks which resulted in scores better than 3.5” drives of the same capacity which is very impressive. 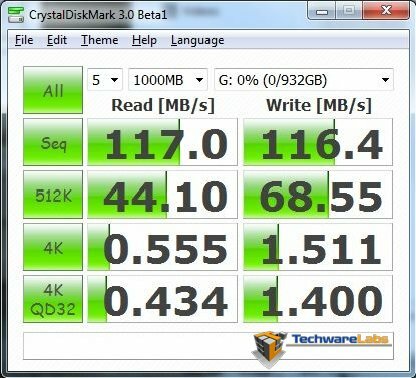 The CrystalDiskMark benchmarks were run with the Scorpio Blue drive with it connected directly to the motherboard and also while installed in our external drive enclosure. The results were very impressive that the scores were so close to each other. We ran the Scorpio Blue 1TB drive through some SiSoft benchmarks and were quite impressed with the performance. 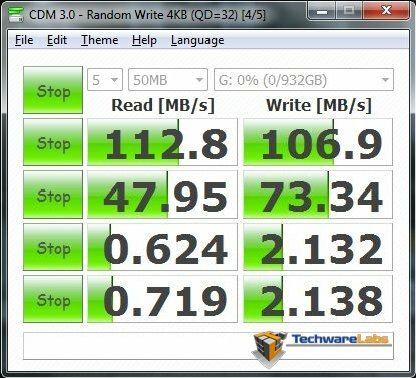 The Scorpio Blue drive is a 5400RPM drive and the results shown below are comparing the drive against 7,200RPM drives and if it didn’t beat them the score was so close that the difference wouldn’t be noticeable to the end user. In other words the Scorpio Blue showed up performed and walked away with the trophies of all around best choice and followed up with a price that no other drive could touch. 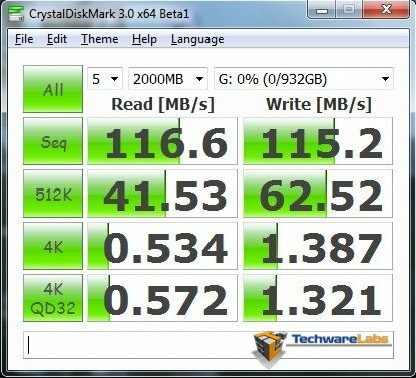 Physical Disks benchmark with the drive connected to the motherboard came through with a very positive score for a 5,400RPM drive which inched out several 7,200RPM drives. With the Scorpio Blue installed in our LianLi portable drive enclosure SiSoft picked up the drive as a USB storage device and compared it other USB storage devices and it came out way ahead of the others. 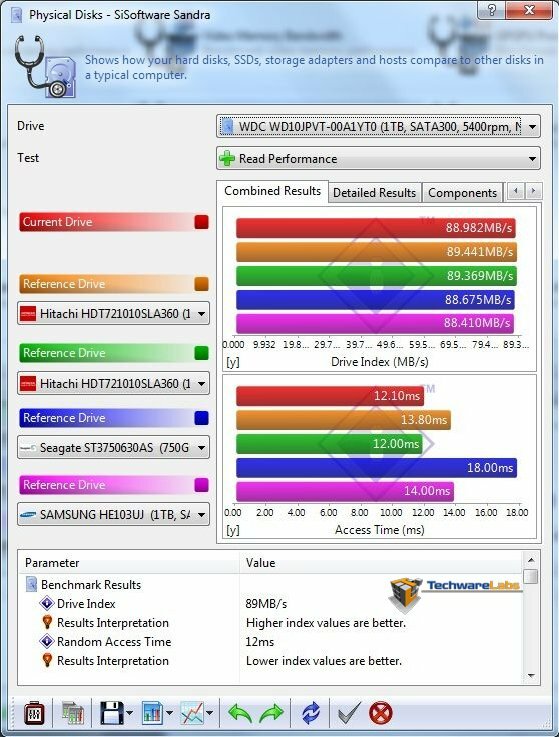 The Sisoft Physical disk benchmark resulted in the Scorpio Blue being scored higher than some 7,200RPM drives of like or smaller capacity. 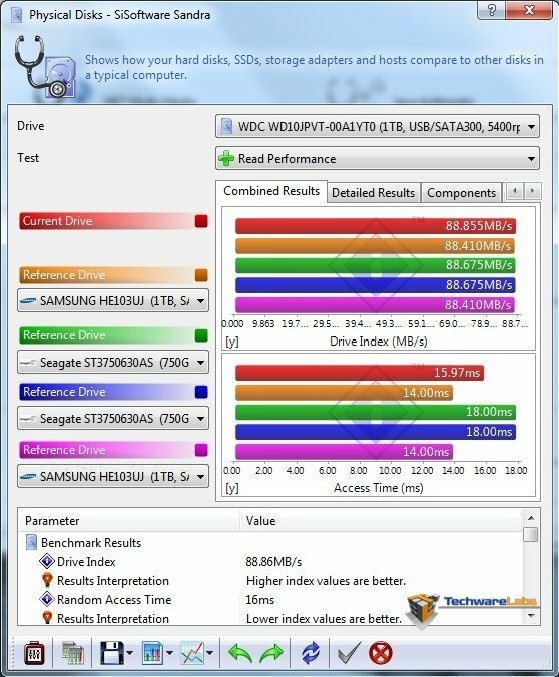 This sets the Scorpio Blue drive apart from other spindle drives on the market today with performance scores and capacity and value unlike anything else on the market today. 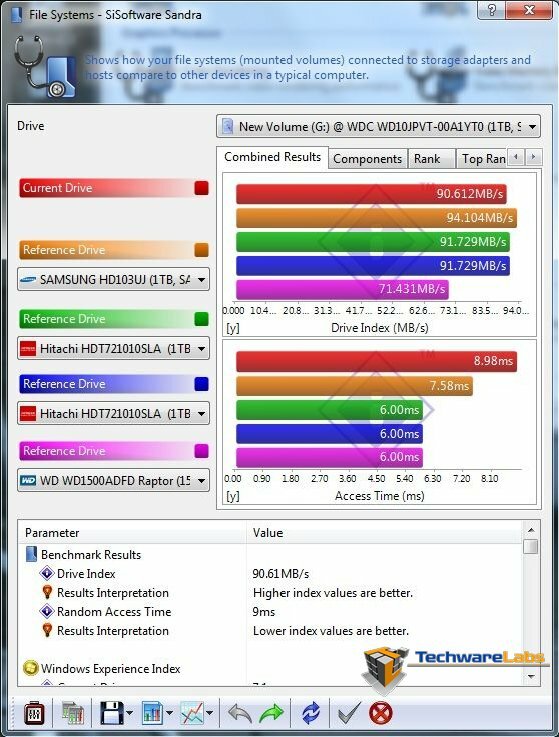 The drives that the Scorpio Blue drive did beat are also a larger 3.5″ drive which uses more energy and takes up more physical space. File system benchmark shows us that the Scorpio Blue once again performed really well for a 5,400RPM drive, placing better than several 7,200RPM drives Once again the USB connected Scorpio Blue drive scores very well against the competition. 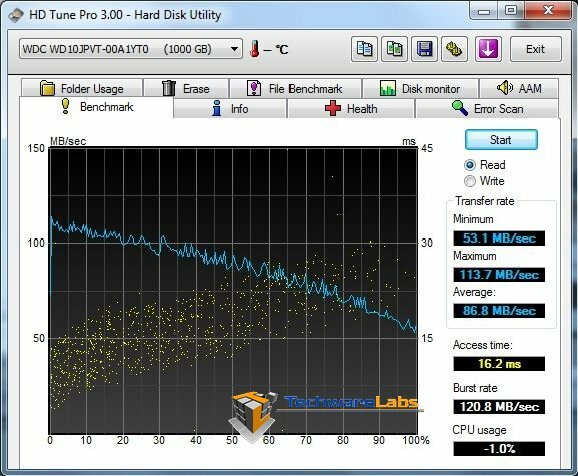 The file system benchmark once again shows the Scorpio Blue drive to be a real performer in the present market of drives on the market today. The simple fact that you can pick up the Scoprio Blue a 2.5″ drive for a price tag (at time of this review) for $150 and a external drive enclosure for another $10, resulting in a portable drive that doesn’t require an external power supply and has the storage capacity of 1TB and on top of all that it out performs most 7,200RPM drives makes the Scorpio Blue the best choice on the market today. The Scorpio Blue connected directly to the motherboard resulted in some very good numbers as we have come to expect from this drive so far in this review. With the Scorpio Blue in our drive enclosure we see here the initial part of the graph is much lower than having the drive connected directly to the motherboard, we would attribute this to drive being put into a low power mode while connected via USB. 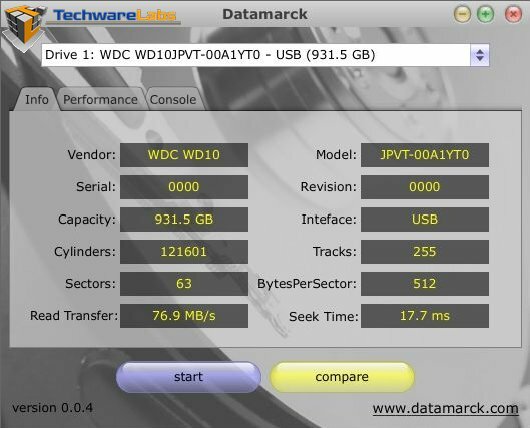 Datamarck scores above are quite impressive as the transfer speeds were matched no matter if the drive was connected directly to the motherboard or connected via USB 3.0. The only difference we saw between directly connected or via USB was the initial start point. Over all these scores were still better than previous spindle drives we have reviewed. Scorpio Blue connected directly to the board resulted in some pretty positive numbers for a 5400 RPM drive. 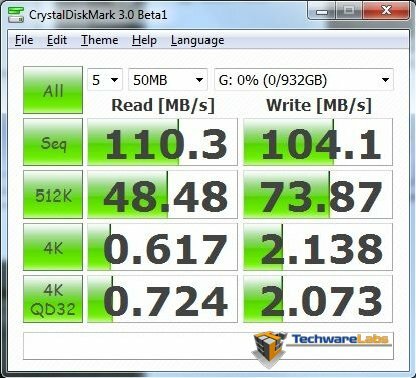 Once again the Scorpio Blue drive connected to the USB enclosure scored nearly the same numbers as the drive did while being connected directly to the motherboard. 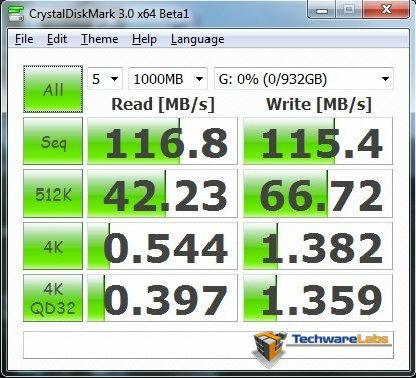 The Scorpio Blue drive is quite an impressive spindle drive thus far in our benchmarks. 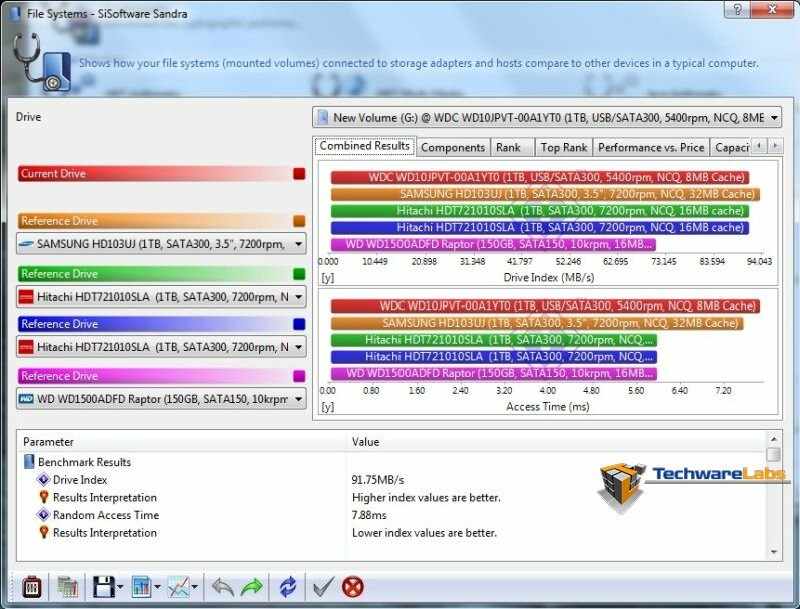 The consumer who is looking for a replacement drive for their laptop that want speed would likely choose an SSD, but since SSDs with any sort of storage capacity at the time of this review are extremely expensive it is not likely most consumers have that much money to purchase such an SSD. 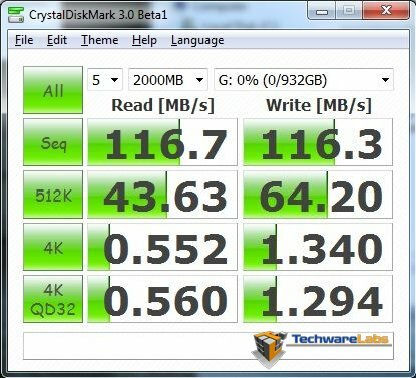 The Scopio Blue so far has been quite impressive with its benchmarks, of course not at the caliper of an SSD, but still faster than most spindle drives which do not have the storage capacity. Posting our score on the Datamarck web site we can see the Scopio Blue is listed as the 64th on the list which is really good for a 5,400RPM drive. 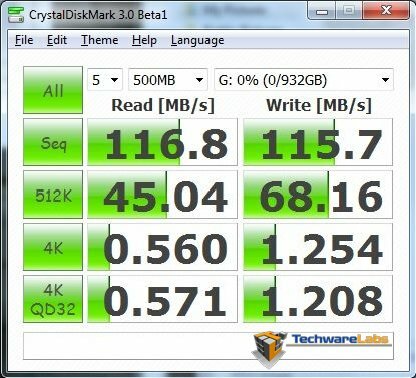 Posting our score on the Datamarck website with the Scorpio Blue drive connected to USB3 put the drive in another category and listed it in the top three drive options for USB 3.0. With the results of the Datamarck benchmark gave us a real insight that the Scorpio Blue is a real performer when it comes to USB3.0 storage on the market today. Not only having a terabyte of storage in a small form factor and no need for an additional power supply to carry with you like most storage devices on the market today the Scorpio Blue was the cheapest in price too. The Scorpio Drive connected directly to the internal motherboard resulted in a little higher score than USB connected. We ran the test another time via USB and internal and still came out that the Scorpio Blue drive connected via USB score a point faster than being connected internally. 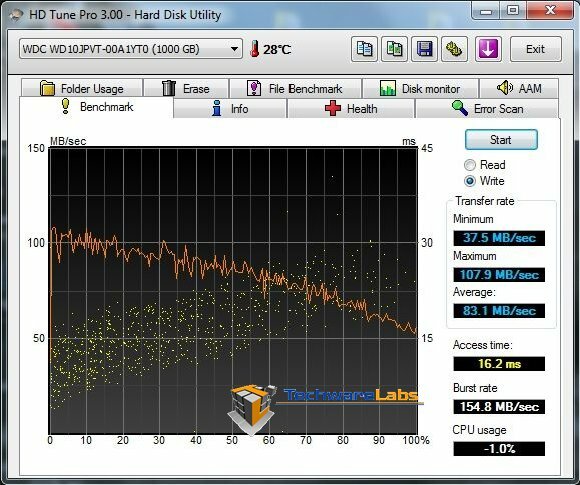 HD Tune Pro left us a little puzzled with our benchmarks here as the drive connected through USB was faster than being connected directly to the motherboard. We re-ran the benchmarks and still had the same results. Though the difference was just a single point between the two, and the score was still very fast overall. The Scorpio Blue connected directly to the motherboard did score better than the USB connected benchmark which is expected. The USB connection of the Scorpio Blue was still put up some impressive numbers. 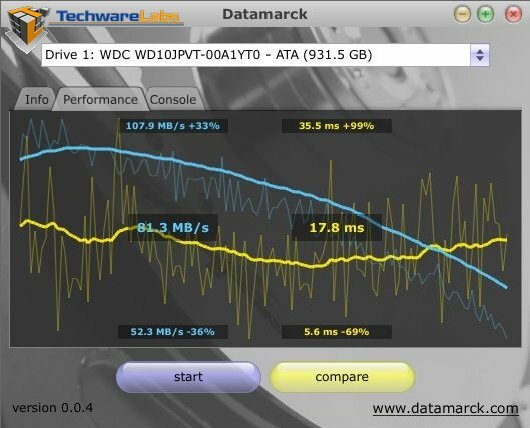 The Western Digital Scorpio Blue has more than impressed us with its benchmark scores which rival other spindle drives of faster RPMs and larger in physical size. The quite operation had us guessing if the spindle was even spinning. The 2.5″ form factor make the Scorpio Blue an ideal option for laptops on the market today and also with the storage of 1TB the SSD drives on the market today can’t compete let alone the largest SSD has a price tag that is six to seven times the cost of one Scorpio Blue drive. The other option that one can choose that we covered in this review is to purchase an external enclosure and put the Scorpio Blue in that. This external enclosure option provides a lot of positive options such as a small form factor, no additional power supply, USB 3.0, and a small price tag to name a few. 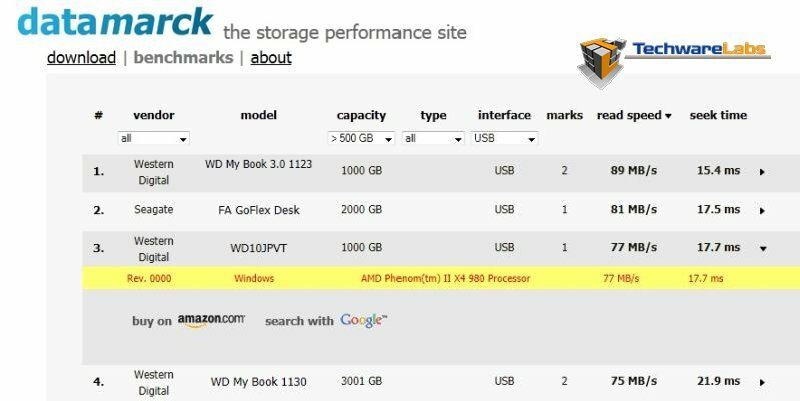 Also as we covered in this review the external drive setup was number three on the Datamarck benchmark web site for external USB drives. 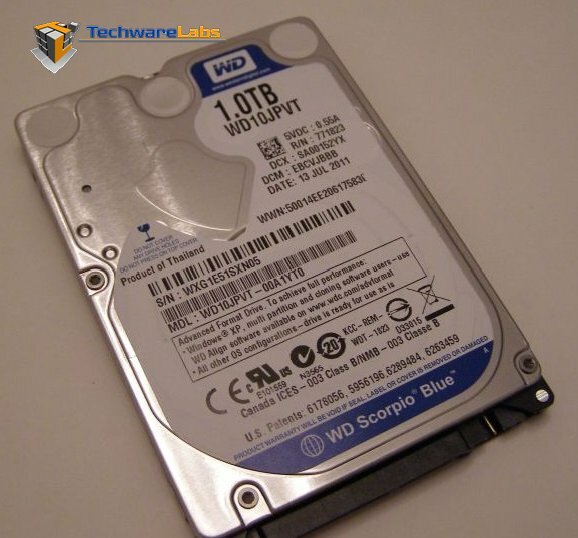 We award the Western Digital Scorpio Blue 1TB 2.5″ hard disk drive the Awesome hardware award for it value performance.